Three Projects Recognized with 2017 OCASLA Awards! Each year the Ohio Chapter of American Society of Landscape Architects (OCASLA) awards the best in landscape architecture from around the state. This year, MKSK are proud recipients of two Honor Awards and one Merit Award for superior professional achievement in projects that embody the creativity, imagination, and outstanding execution in the profession of landscape architecture. MKSK would like to congratulate our clients and the design teams for their outstanding efforts that have resulted in the three following award winning projects! The new Clinical Sciences Pavilion at Cincinnati Children’s Hospital embodies the hospital's commitment to research, innovation, and collaboration. Translational research – the move from bench to bedside is a core part of CCH mission. The site, which comprises the most significant contiguous green space on the main hospital campus, symbolically bridges this gap between the new Clinical Sciences Pavilion and research campus to the west and the hospital’s main clinical care center to the east. A series of therapeutic gardens and respite space were developed that address the physical, mental, emotional and spiritual needs of hospital patients, families, visitors and staff. Water was used as an unifying element throughout the campus design, expressing itself in many forms and moods from a simple skim with playful pop-jets in the research garden, to a strong consistent presence along the garden passage, to the dramatic water walls of the Galleria Courtyard. Cincinnati Children’s Hospital believes that the physical environment is a direct reflection of itself, its core values, and what it strives to achieve. The Clinical Sciences Pavilion and its landscape looks to support the integration of research and family-centric care and is meant to inspire and enable the life-changing work the hospital performs. The plan worked to advance a wide range of health, economic, and environmental benefits for residents in the City of Columbus. Developed through a broad and engaging process, this collective effort informs public policy, inspires program development, fosters community collaboration, guides local funding strategies, and establishes the foundation for successful philanthropic requests and public grant applications. Conversations with policy makers, community members, working groups, green business entrepreneurs and urban agriculture practitioners led to five themes emerging as the overarching vision for implementation of green business and urban agriculture within the City. This project highlights the impactful and varied role of landscape architects in modern urban issues including environmental quality, land use, public health, and economic prosperity. Adopted this fall 2017 by the Discovery Special Improvement District and the Columbus Downtown Commission, the Discovery District Plan ties the district’s 40+ anchors and institutions together along a path of public art, public spaces, and placemaking opportunities throughout the district. Opportunities for placemaking were identified through a planning process of careful analysis combined with robust community engagement. More than 800 residents, students, employees, and visitors contributed to the process, defining an identity for the Discovery District and plotting a Discovery District Trail system of placemaking sites. 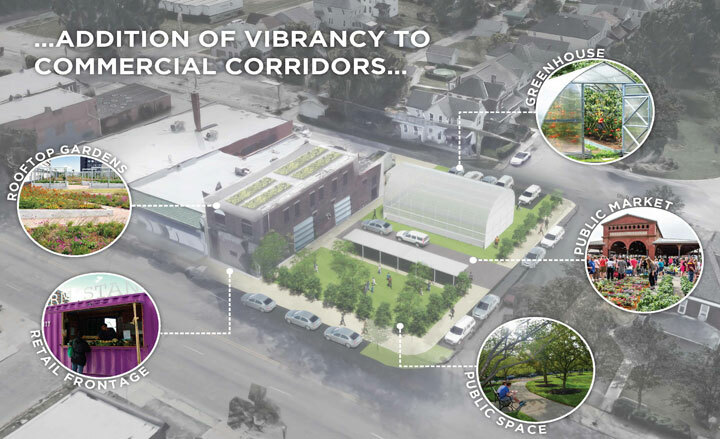 The proposed trail creates meaningful physical connections between the district’s many institutions—including the Columbus Museum of Art, Columbus Metropolitan Library Main Branch, Columbus College of Art and Design, Capital University, Franklin University, Columbus State Community College, Grant Hospital, Motorists Insurance, and more—aimed at unifying the district through art and showcasing its identity. Implementation efforts are currently underway, and the plan has enjoyed other recent recognition as a feature of a ULI Hard Hat Tour, and media coverage in Columbus Underground,Colmbus CEO, and Columbus Business First.